Our summer has been a bit drab or boring if you will. We have not had a lot of activity mostly for financial reasons, of course there are things to do for free, but not everyday and even if they dont have an entrance fee, there is a cost to get there or expenses needed on the day! So it has been a pretty quiet summer for us. We have the pool here in our complex, which luckily has not been too busy and the beach a few minutes drive away. Also with everything going on we havent really had the mind to enjoy summer if you know what I mean. But we have had some nice times, unfortunately not with so many photos this year as my camera is broken :-( which is a big shame as it looks to be our last here in Portugal. We have had family visit and spent some time with them, we have had our local facarte which offers a few days of entertainment, visits with friends, days on the beach etc. But we have had two significant successes this summer with both my children. 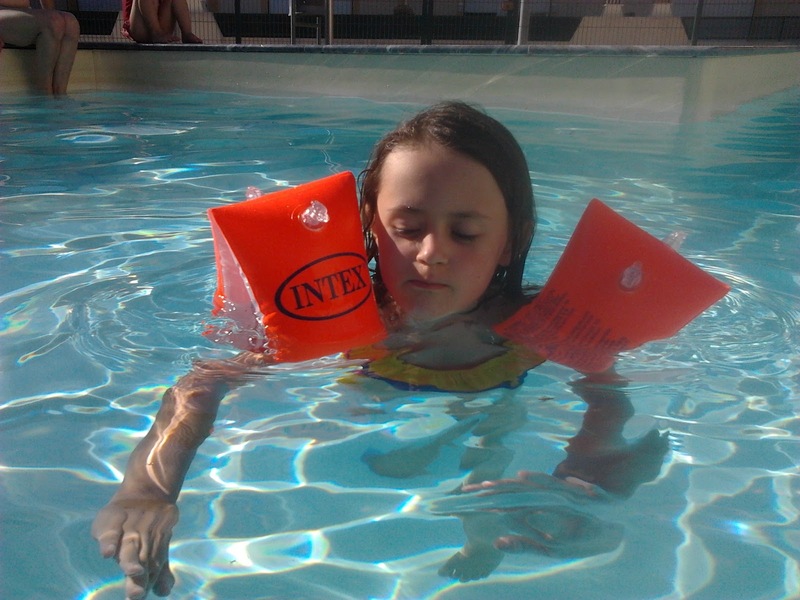 Sophie who is 6 and a half years old, despite having lived with a pool accessible every day has always been a bit scared of the water and not confident at all. When we first arrived and she was 2 and a half, no matter how hot it got, she would not get in the pool for more than 10 minutes! She has gotten a little better over time, having taken to a ring and quite happily splashing about, occasionally putting her face into the water, but wouldnt put her head back, no jumping, lifting nothing, she hated it and would cry. But in the last month or so, a BIG change has occurred as if overnight, she got confident. Suddenly she wanted to jump and start to learn to swim so holding her, we helped but that only lasts so long. 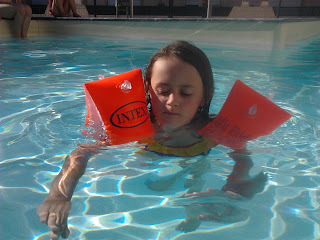 So we bought her some armbands (she would never wear them before, I think because of feeling of lack of all round support) and off she went. Now she goes underwater, jumps into the pool and all, its amazing and if over night and she loves the water. Our second big success is my younger daughter, who has turned 3 at the beginning of the month. With both my children I have purposely left potty training to the nearer side of three, giving them as much time before training them. So when Grace was about 2 and 8 months or so, (about the same time as Sophie) I decided to start trying. I had tried a few months before but she clearly was not ready. So we started and tried for a few days, she was excited to wear knickers, and mess about with the toilet but nothing happened. On and off we tried but were clearly getting nowhere. She would sit on the toilet do nothing and then within minutes pee on the floor or hold it for hours, until I put a nappy back on and then fill it within 30 minutes, very frustrating! We put here in pull up pants and at nursery she would follow her friends who were also training, eventually after a few weeks she started going in nursery but still nothing at home. Then last week, it suddenly clicked. We put her in knickers for some time every day, in the hope of success but also due to the heat but suddenly she said she needed to make pee pee, so we put her on the toilet like I had done a hundred times before but this time it worked, I was so happy! And as I cheered her on, she laughed, a good sign. Not wanting to get too cocky and hail success, I cautiously waited, but she did it again and again. Now we have had about 5 days and all seems to have fallen into place, as if overnight. I knew she would get it but had no idea how long it would take and worried with her starting pre-school where she would need to be potty trained within a month! So despite a quiet and little bored summer for the kids (if not the parents, too stressed to relax) we have had two big successes!